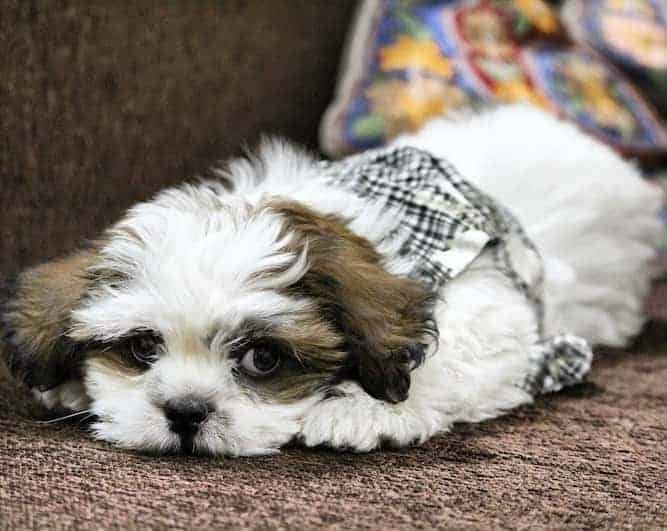 Lhasa Apso Temperament: Can You Handle This Cute Dog? 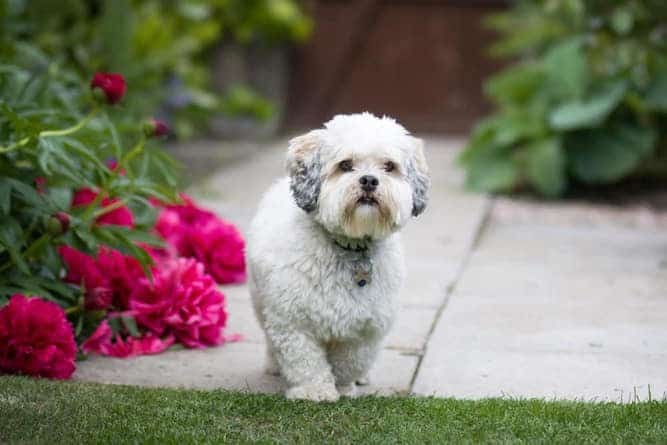 Before you decide the Lhasa Apso is your breed of choice you should learn about the Lhasa Apso temperament, and how to deal with it. I think you would agree that the Lhasa Apso has looks to die for. Would you feel the same after learning about the Lhasa Apso's temperament? Read on to determine if this is indeed the little dog breed you've been searching for forever. Note that personalities of each dog may differ slightly from members of the same breed but generally, most of them have similar characteristics. The Lhasa Apso has an independent temperament. If you have ever owned a cat, you will understand what this means because this breed has a cat-like tendency. For example, if you give your Lhasa a command such as “come”, your Lhasa may very well take his own sweet time to respond. The Lhasa Apso breed is anancient breed. Lhasa Apsos originated in Tibet over 1,000 years ago. They were bred to be watchdogs for Tibetan monasteries, and they were kept as pets by the Dalai Lama. The Lhasa Apso appears as a character in many Tibetan myths. According to one Tibetan folktale, the Lhasa Apso is the earthly embodiment of the mythical Snow Lion—the protector of the country. Another story claims that when a spiritual leader dies, his soul takes temporary refuge inside a Lhasa Apso dog until the soul can be reincarnated into human form. The name “Lhasa” is thename of a sacred city in Tibet. The Lhasa Apso is a sensitive breed that is not fond of strict discipline. When training them it is best that you use the reward system. Give your Lhasa Apso an occasional treat to encourage a positive response. And avoid harsh discipline otherwise you will get some retaliation from him. Yummy treats, rewards and high praise will yield the best results. The Lhasa Apso is a friendly and intelligent dog and any corrections of unacceptable behavior should be handled with care. However, despite its sensitive nature you as its master and trainer still need to be firm with your dog. If the training of the Lhasa Apso dog is not firm, the pooch is likely to display a yapping, nipping and aggressive behavior. One of the best tips that will help you train your Lhasa Apso effectively is to start by winning the dog’s confidence and admiration. It is during this time that you should let the dog know that you are the leader. In order to improve the training sessions, you should teach the dog to respect you and all the instructions you give. Avoid showing affection at inappropriate times, for example when you are giving instructions. Note however that many of the negative behaviors Lhasa Apsos show are often human-induced, and not in this breed’s nature. All a more reason to be the leader and help develop the Lhasa Apso temperament that’s more in line with the dog’s true nature. For help with training your Lhasa Apso take a look at The Online Dog Trainer by Doggy Dan. Doggy Dan is an expert Dog Trainer based in New Zealand. His online resource contains Hundreds of Excellent Dog Training Videos that will take you step-by-step through the process of developing a healthy, happy well-behaved dog. 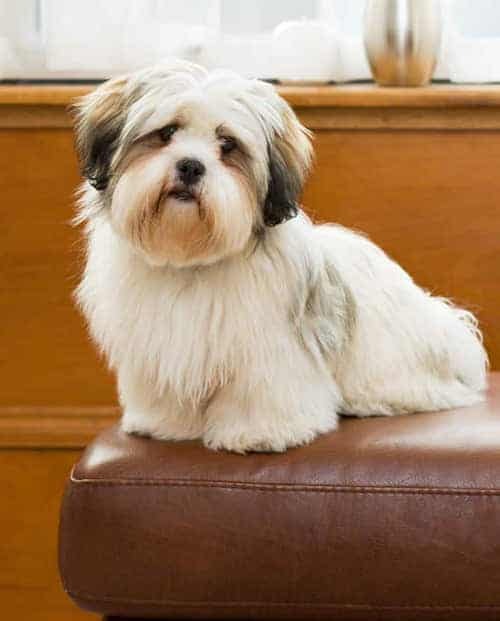 Some common Lhasa Apso behaviors include an ongoing barking, nervousness, an intolerance of children etc. Because of the dog’s assertiveness, you should never leave them alone with children. 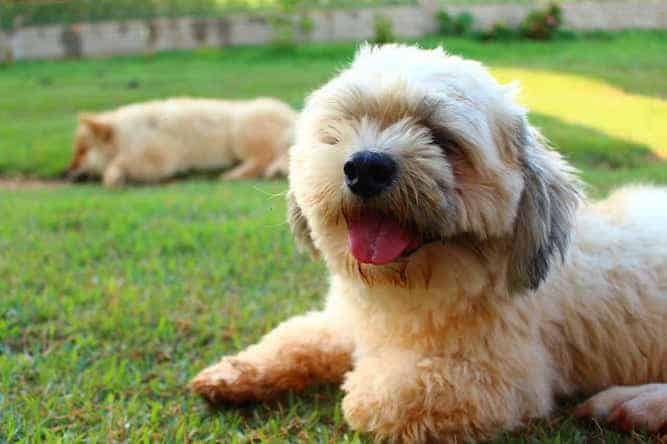 To correct most of these and other aggressive Lhasa apso behavior, your dog needs both mental stimulation and physical exercise on a daily basis. Click here to learn how exercise helps dogs with bad behavior. When training this dog, you should have the right mindset. The dog is obedient and affectionate with its masters but can sometimes be stubborn especially if the owner is weak. The Lhasa Apso also has a tendency to display a suspicious nature with strangers. If you are looking for a cute dog, then look no further, the Lhasa Apso is the dog for you. This breed of dogs is just irresistible but one that requires a lot of maintenance. Its long hair requires regular care so that it does not mat up in clumps. This breed of dogs also has floppy ears that are prone to infections. However, the cuteness should not give you the wrong impression because this breed of dogs is more difficult to train and also more stubborn than other dogs. The point is to be careful to take all the Lhasa Apso's temperament traits into consideration before you get swept away by looks alone. You do not have to take your Lhasa Apso for a great deal of outdoor exercise because he can comfortably play and exercise indoors. Lhasa Apsos are also playful and good at entertaining themselves so you do not have to always be around. Some dogs will get serious separation anxiety if you leave them alone, a well trained Lhasa would not. Lhasa Apsos make great pets. They are also a good choice if you or any member of your family is allergic to dogs. Well, not totally but you can live comfortably with the Lhasa Apso without having to worry about excessive barking. Lhasa Apsos do not bark unnecessarily like many other dogs because they have a discriminating hearing. They are able to distinguish between unusual and day to day noise. you should bring your Lhasa Apso to the vet for regular checkups. Like all dogs, your Lhasa Apso should also receive flea and heartworm prevention on a monthly basis. Spaying and neutering are highly recommended. With good care, the Lhasa Apso lifespan is 12-15 years. Lhasa Apsos are small companion dogs. They weigh between 12 and 18 pounds. They stand between 10 and 11 inches tall. 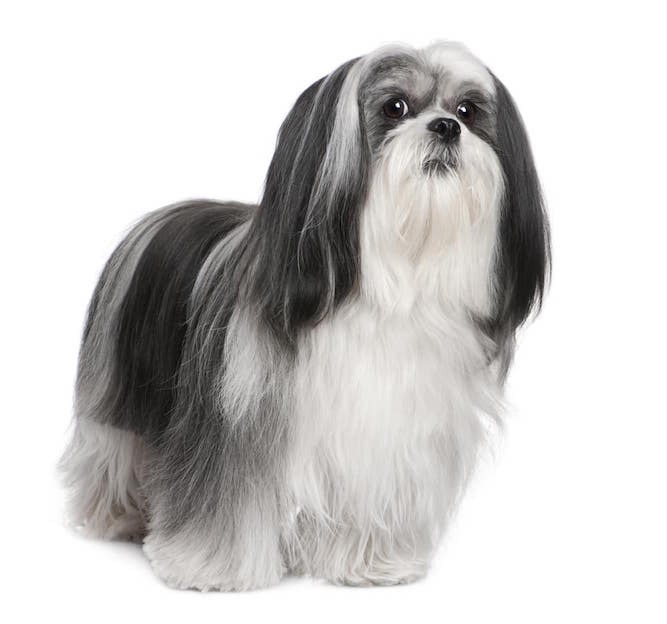 Lhasa Apso colors includeeverything from black and white to gray and tan. All colorations are acceptablewith or without dark markings on their ears and face. Lhasa Apso shedding is minimal, which is a major perk for many people. Lhasa Apso grooming must take place on a regular basis. Otherwise, the Lhasa’s fine hair can tangle and become matted. Bring your Lhasa Apso to a professional groomer every 1-2 months for grooming. 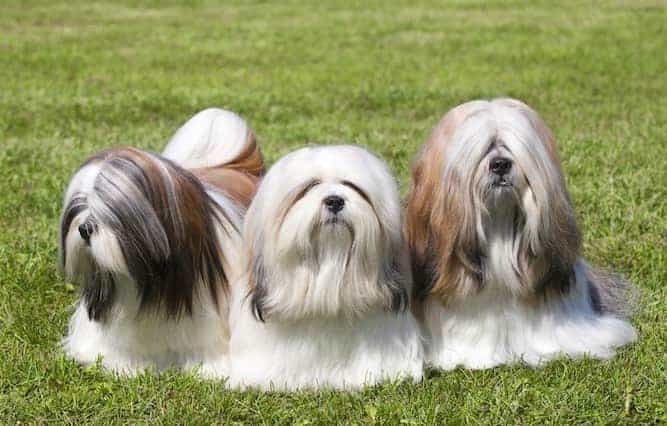 The Lhasa Apso coat type is the type that requires frequent trips to the groomer, so make sure you take into account the grooming expense when you are considering this breed. Is the Lhasa Apsohypoallergenic? 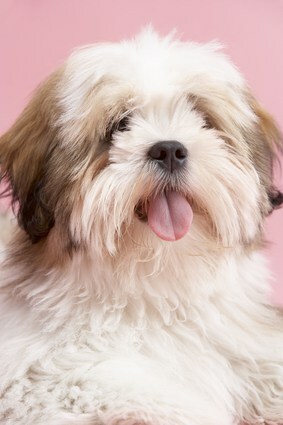 Yes, the Lhasa Apso is one of the few breeds that is consideredto be truly hypoallergenic. This makes the breed an ideal option for people whosuffer from allergies. Any brand of high-quality dog food will work for your Lhasa Apso. You can feed your Lhasa Apso dry food, canned food, or a combination of the two. Lhasa Apso eating habits vary between individual dogs. Treats are fine in moderation for training. Avoid feeding your Lhasa Apso any human food. Daily exercise is important for all dogs. 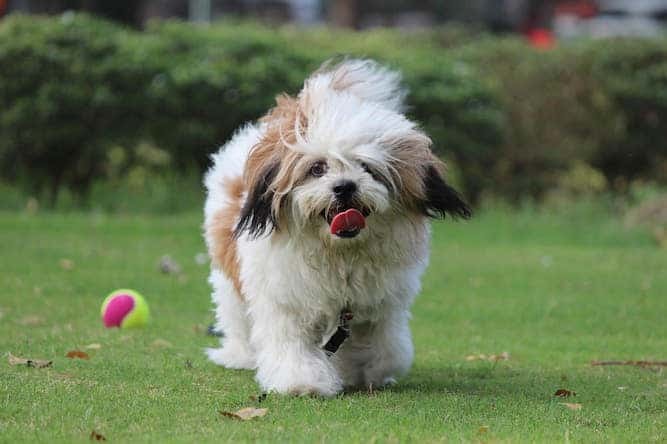 Lhasa Apsos need exercise, but they do not need as much physical exercise as many other breeds. If you are looking for a breed with lower exercise needs, the Lhasa Apso might be right for you. However, they still need daily walks and playtime. Mental exercise is alsoimportant for dogs of all breeds. If dogs do not receive enough mentalstimulation, they become bored and disruptive. Keep your Lhasa’s mind engagedwith enrichment activities such as training, food puzzles, and work-to-eattoys. There are numerous Lhasa Apso rescue groups around the country. These groups specialize in finding homes for Lhasa Apsos that need to find new families. You can find rescue groups in your geographic area by doing an internet search for “Lhasa Apso rescue groups” in your region. You can also visit your local animal shelter or humane society. Lhasa Apsos and Lhasa Apso mixes are fairly common in shelters. Your shelter might not have one right away, but you can ask to fill out an application and be put on a waiting list in case one comes in. If you are open to a Lhasa Apso mix you may find a good match sooner. Animal shelters receive quite a few Lhasas that are mixed with Shih Tzus. This seems to be a very common mix at the moment. Mixed breed dogs tend to be healthier and live longer lives than their purebred counterparts. The internet is a great tool for finding a Lhasa Apso to adopt. You can search national adoption websites such as Petfinder.com and Adoptapet.com. These websites will allow you to search for a certain breed within a certain geographic radius. You can also set up an alert so the website will notify you when new Lhasas become available for adoption. You may notice that many of the dogs available through rescue groups are teenagers, adults and seniors. It is rare for shelters and rescue groups to have Lhasa Apso puppies available. However, puppies are available from time to time. On the other hand, adopting an older dog has a lot of benefits. Adult dogs are calmer. Sometimes they have prior training. They do not require as much attention or as much constant supervision as puppies. If you adopt through an animal shelter or humane society, the Lhasa Apso price will probably be around $75-150. If you adopt through a private rescue group that specializes in Lhasas, the adoption fee will probably be a little higher. Private rescue groups will usually do more vetting, including heartworm treatment if needed. All adopted Lhasas should come spayed/neutered and vaccinated. If you decide to work with a breeder, be very careful to make sure that you are working with a reputable breeder. You can visit the website for the American Lhasa Apso Club for initial recommendations. Lhasa Apsos puppies arevery cute and desirable, so they are a favorite breed for puppy mills to sell. Always make sure you visitthe property of your breeder to make sure that you are not inadvertentlyacquiring a puppy from a puppy mill. Puppies from puppy mills areundersocialized and sickly. Puppy mill breeding dogs are kept in abysmalconditions. Never purchase a LhasaApso puppy or a pup of any breed from a pet store or over the internet. Once you have identified apotential breeder with Lhasa Apso dogs for sale, make an appointment with thebreeder for a visit to the home. Make sure the puppies areliving in clean conditions and being raised as pets. Request to see theirvaccination records and their parents’ veterinary records. Your breeder will want a chance to ask you questions as well. Responsible breeders want to make sure that their puppies go to the best possible homes. Most breeders will ask you to return the puppy to them if things do not work out for any reason. A good breeder never wants one of their puppies to end up in an animal shelter or homeless on the street. If your breeder does notallow you to visit and/or does not ask you any questions, be cautious. You maywant to keep looking. If you purchase through a breeder, the Lhasa Apso cost will be at least $1,200, and it can easily go higher. 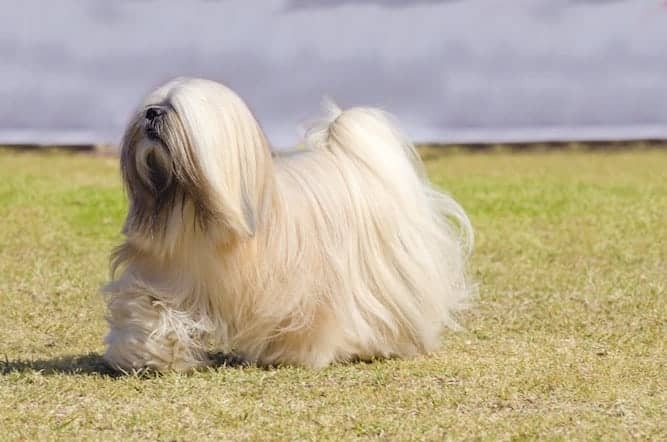 If you purchase a Lhasa Apso show dog, the price tag can be over $5,000. The Lhasa Apso belongs to the Non-Sporting Group. The breeds in this group are all over the spectrum when it comes to appearance, and their temperaments are equally diverse. Take a look at the following temperaments of other members of this group to get a feel for their personalities. Conclusion: Why the Lhasa Apso? The Lhasa Apso temperament is appealing to many people. Lhasas are fun and affectionate. At the same time, they do not require an excessive amount of exercise and they are usually fine being left alone during work hours. Their hypoallergenic hair barely sheds, and they are an ideal size for many people. Many owners consider them to be the perfect package!